It's my passion! More often than not, I get to create the exact kind of work I am craving, not long after the craving first shows its face. Life sends these specific contracts my way, as soon as I desire to explore a certain aspect of my work. And I feel blessed that most customers trust me enough to leave me tremendous freedom in the design. Still, sometimes, the life of a full-time freelance creature designer/maker/performer isn't so glamorous. You certainly don't get to rest for very long! In fact, I've never even ever taken a true vacation. Every day off I've taken, not counting sick days, which are very rare) was spent in part for research or networking. I would never stop doing what I love. I chose this lifestyle! Yet, Life IS change, and if I want to keep enjoying mine, some changes must be made! As much as I enjoy a schedule that's not too repetitive, there is such a thing as too much chaos, and too much to do. I'm never bored and I'm thrilled constantly with the results and opportunities I get. I just seek more stability. Good news is, I can feel it coming around the corner. (See Unraku, below) Even the most motivated individual gets tired sometimes. The following will show what I mean. This summer, with multiple small contracts that were constantly overlapping and usually rushes, coupled with a month-long preparation for a month and a half solo gallery show of my work, was a non-stop race, and this speedy pace seems to be continuing into the fall. Marotte of a little girl puppet, picked up by the customer. Had to repaint and change its haircut in 35 minutes. Did it with success! I just learned I will not have a minute to rest Monday night, after the 8 hour bus ride back from a trip, because a puppet needs to be mostly re-built and be ready for a day and a half later (see Tabletop Puppet of Terror below). Will assemble my Satyr puppet, which needs to be fully articulated by the end of today, so I can bring to Toronto to show my colleagues this week-end. Will get two puppets picked up by past customer who lent them for my gallery show this summer. Will get an in-progress puppet back from a current project which should have been finished two months ago (customer paid deposit a month late, and took weeks, several times, to provide vital information). I wish I could drop this project, and I would feel entitled, considering the insulting delays and "bullshitting", but the project's instigator owes me half the payment (upon delivery), and two colleagues I highly respect are still involved in the project and need the puppet. Life sure wants me to learn to be a "though guy" when it comes to choosing my contracts and conditions. ever since I saw an inspiring sign in a bus station in Brasttleboro Vermont: "Your lack of plannification does not constitute my rush". Lesson learned! Tonight Still working on that Satyr puppet, broadcasting some of the process live on blogTV. Preparing luggage for Toronto trip. On a very positive note, there are highlights that make this all worthwhile. The obstacles and complications just seem like small bumps when focusing on the good! Yet, I know it will all work out and the situation will stabilize! I'm now the Montreal branch of a Toronto puppet company named Unraku. We moved in to our first official studio about two weeks ago. I can't wait to see what they did with the place, as it was already very promising when I last saw it. I'm Looking forward to this week-end, I'll see my Unraku colleagues again, one of which I never met in person, as she hails from Pheonix, Arizona! We are shooting a music video, as a promotional tool for the company. We shall also attend an evening where I will meet Alexander Mergold, an Art Doll and Puppet artist whose work I've admired for years. The evening will be hosted by Open Door Design, a lovely puppet store in Toronto. The main project for Unraku these days is one I cannot yet reveal much about, but it's going to be big. I'll keep you posted as the information becomes available for release. Here's what I can say about it now: It's going to be a weekly puppet show, published online. Assembled in Toronto (homebase), but filmed in Toronto, Montreal, and Pheonix. The creatures will be varied, and the fun will be palpable! We shall be promoting the show at the Central Canada Comicon in Winnipeg (Alberta, Canada), at the end of the month, as well as other festivals and events until March, when we are going to Megacon, in Orlando(Florida). •I'm building (not designing) the official puppet for an artist/writer who has a series of music albums and books for children starring a squirrel. I'm looking forward to it. •I was hired to create a one-of-a-kind little girl glove puppet as a birth gift. 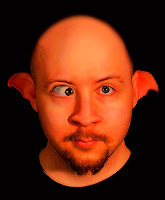 To see me in action, I very often broadcast my creaturemaking steps live from Blogtv. I don't have a schedule, but it's usually evenings and nights.